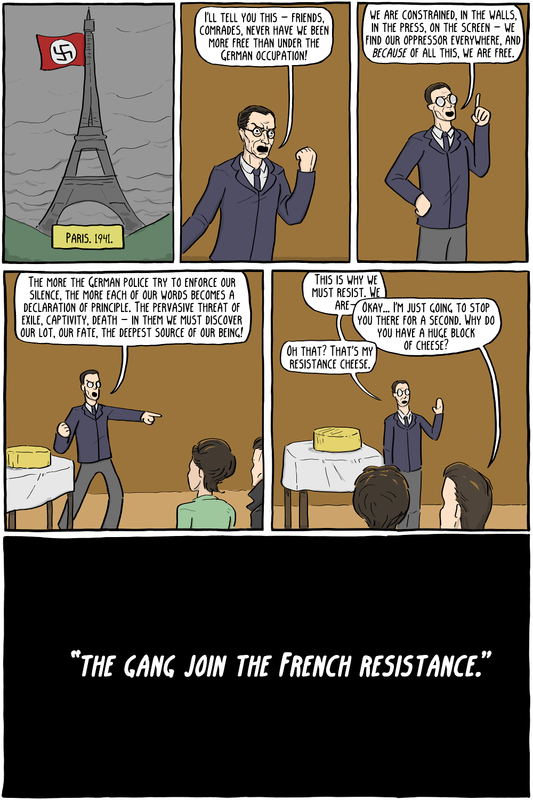 During the occupation of Paris all three of Sartre, de Beauvoir, and Camus worked with the Resistance in various ways. 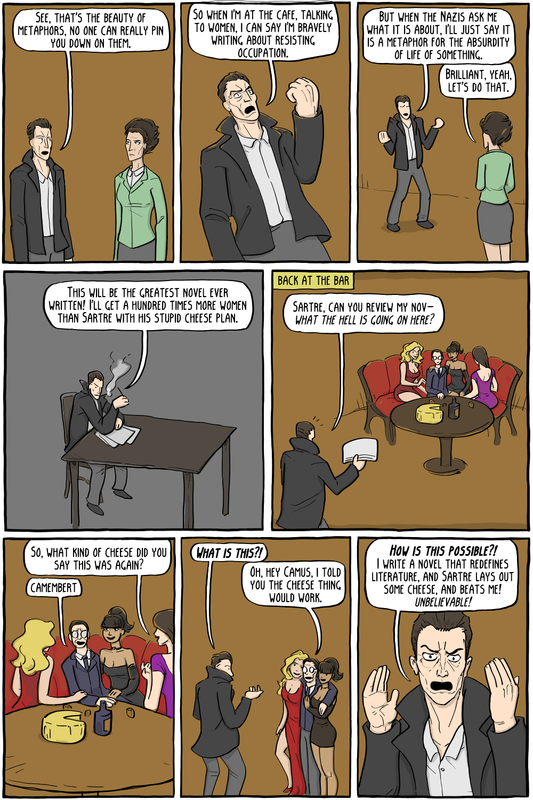 Primarily, they wrote articles for Combat newspaper, of which Camus was the editor. Immediately after the war, they wrote a lot of rather self-aggrandizing articles about themselves, and their role in the resistance (not an uncommon occurrence at that time, everyone was very eager to paint themselves as a resistance fighter, for obvious reasons). 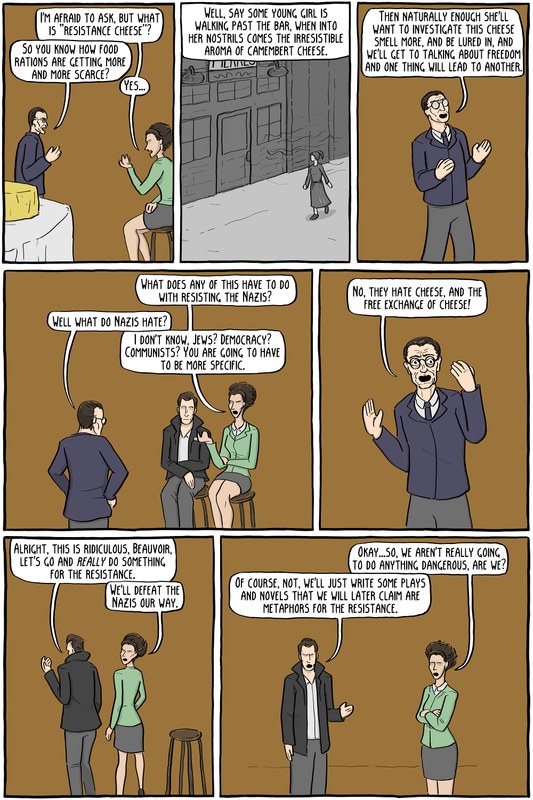 Sartre's dialogue in the first panels are basically quotes from his article The Republic of Silence, which condemned intellectuals, and others, who collaborated or did not actively resist. However, being interviewed on the subject some thirty years later, he realized that things were not so black and white. Many who did not resist were terrified of death, and hopeless that their efforts would have any effect. Even those who did resist often played it safe, and only did what they knew they could get away with. Sartre, for example, wrote No Exit during the occupation, a play he claimed was a metaphor for the Germans, but the play was not censored, and many German officers attended and even mingled with the cast. Simone de Beauvoir wrote and published She Came to Stay, which also went uncensored, as did Camus's The Stranger. In other words, they weren't exactly setting off car bombs, they were mostly doing what they did during the non-war years: writing plays, novels, and philosophy. That isn't to say that they played no part in resisting the Germans, but...well, the story about using cheese to lure in women is supposedly true.